As I may have mentioned, I’m having none of this credit crunch nonsense. There’s no point trying to save money by buying cheap, ineffective stuff and then having to spend more money on something to repair the damage done by the rubbish products. Also, it is pay day so hurrah hurrah. Great. I have adequately convinced myself – did it work on you? It’s a rationale I usually save for handbags but today, I’m using it on the AMAZING Dr Bragi Face and Body Salvation. I know I’ve spoken of the wonder of Dr Bragi before, penzyme-schmenzyme, it’s witchcraft I tells ya. When I run out, I have a little cry. But what about the rest of my body, I hear you cry? Can my cold, chilled, dried out by central heating limbs benefit from this wonderous serum as much as my pretty, pretty face? Happily, the answer is now yes. 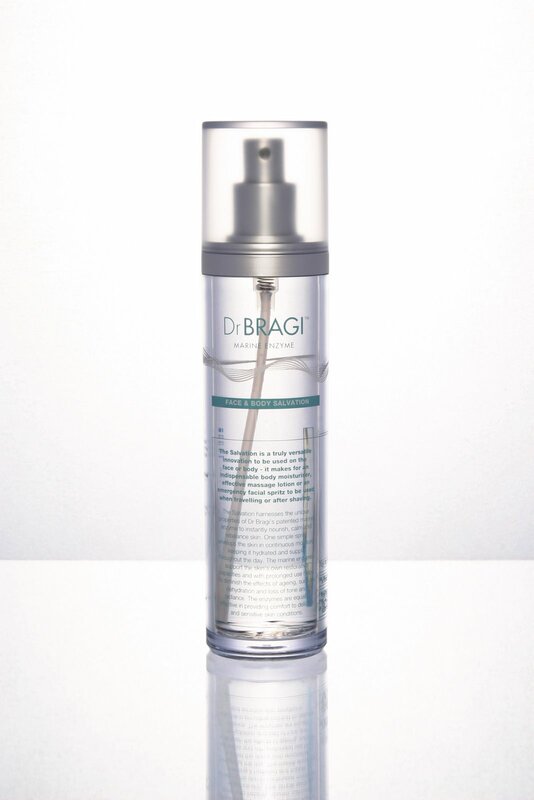 Dr Bragi has introduced a new product into the range, specially designed to hydrate all over the body. Okay, confession time, I really to try to moisturise all over at least before bed, if not morning and evening, so afeared am I of Madonna claws and the like but just lately, I’ve been so late to bed (have I mentioned I’m writing a book? I have? Oh.) and so late up in a morning that the steps are slipping. No more. The Face and Body Salvation is a hand-dandy spray that is so easy to spritz on, I can even do it with my eyes closed and the results are incredible. After just a couple of days, my shins had a moisturised sheen back (I’ve been suffering from opaque tights induced paperiness) and my skin was just so soft to the touch. I’ll never go back. I’m pasting in all the wonderful things this spray can do because I couldn’t list them without sound like an infomercial. All I can do, is say I would happily hand over £100 for this product and I don’t say that often. The bottle is huge and the results are measurable, immediate and long-lasting – what else are you looking for? New Beginnings… New Fragrance – from Usher?